The Houston Rockets have finally crawled into the All-Star break. They would have preferred to do it with a win over the Minnesota Timberwolves, and they would have preferred to have the whole team healthy. Unfortunately for them, they'll have to settle for a chance to regroup and recoup for the next seven days, and put this loss behind them. How did they lose? They lost the same way they always lose: rebounding and defense. Luol Deng was allowed to 13 points in 2019. The rim was wide open. The Timberwolves hit threes at will, to the tune of 10 of 20. If they'd taken 53 threes, like the Rockets did, and made half of those, too, they would have won by about 30. They lost the rebounding battle 47 to 37. That's bad. That's all bad. The rebounding and defense will improve when Clint Capela returns to the lineup after his protracted absence. If and when Danuel House becomes a full-time member of the team, he'll help as well. If they sign Markieff Morris, as they're rumored to be on the verge of, that's another step towards length for a team unable to reach out and grab a board. All that, however, is for tomorrow. Tonight, it wasn't clear if the Rockets were in the game because the Wolves aren't very good, or if the Wolves were in the game because the Rockets aren't very good. Every year, teams limp into the All-Star break. Every year, the Rockets limp especially hard. They needed it last year and they need a week off this year to heal, practice, organize and focus. It's a grueling season in the NBA, and the teams who've been through this regular season a thousand times especially feel the slog at the two thirds mark. This miserable moment is hardly unusual, and it's not really much of an indictment. It just was a lot easier to look past when they had thirteen losses at this point rather than twenty-four. But, hey. 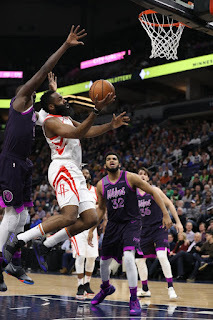 James Harden's streak of thirty-point games is still going, and in the end isn't that really the stated goal?